Construction, Renovations, and Upgrades … Oh My! In preparation for our 2017 annual Gathering, I was in Pennsylvania in mid-June for a week and had the opportunity to visit the camp for an afternoon. And let me tell you, the camp is not sparing any expense on the new construction, renovations, and upgrades they are making to the facilities! Let’s start with the cabins. At the time of my visit, six cabins have been totally renovated; I mean, from top to bottom. 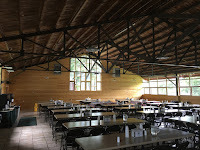 Those six cabins have brand new interiors including new knotty-pine interior siding; the rafters have been removed and the ceiling has also been finished in knotty pine. 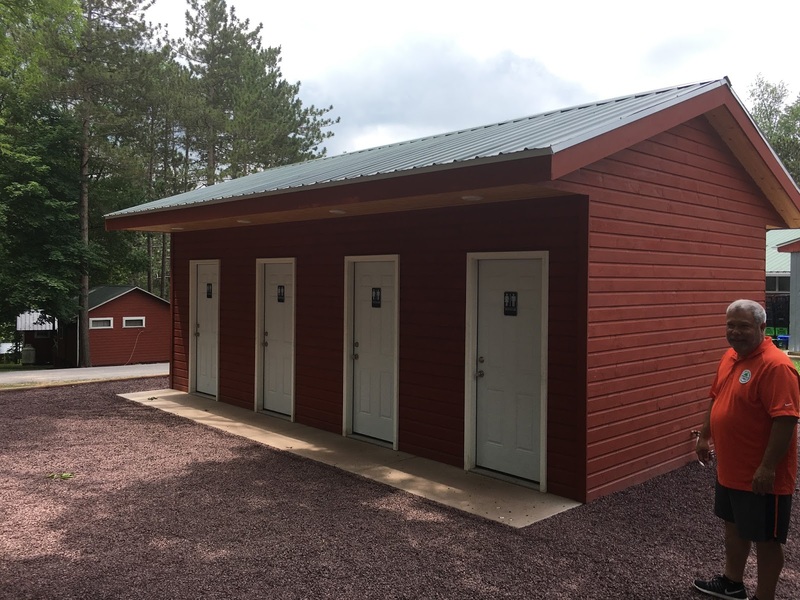 You’ll also find brand new bathrooms in these cabins – new toilets, showers, sinks, faucets, and even new electrical outlets at each bed. In addition, the old windows have been replaced with double pane, tinted windows that actually close tight! And finally, those cabins have real doors. Real doors! 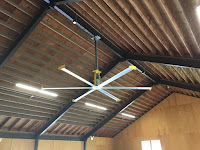 And a ceiling fan!! 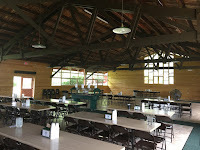 The next huge renovation that you’ll immediately see if you’ve been to The Gathering is that both dining halls have also been redone with knotty pine siding and new light fixtures over the serving line! This changes the ambiance of the dining halls completely. Remember the two bathrooms right outside the doors on the back side of both dining halls? Yup, they’ve been totally refurbished, too, with new fixtures, lights, and knotty pine siding. But it doesn’t stop there. Remember the two sets of mobile port-o-potties that were parked behind the left dining hall? Well, they’re gone. 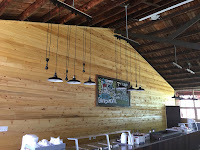 In their place is a whole new building structure consisting of eight (8) brand new restrooms, also done in knotty pine. 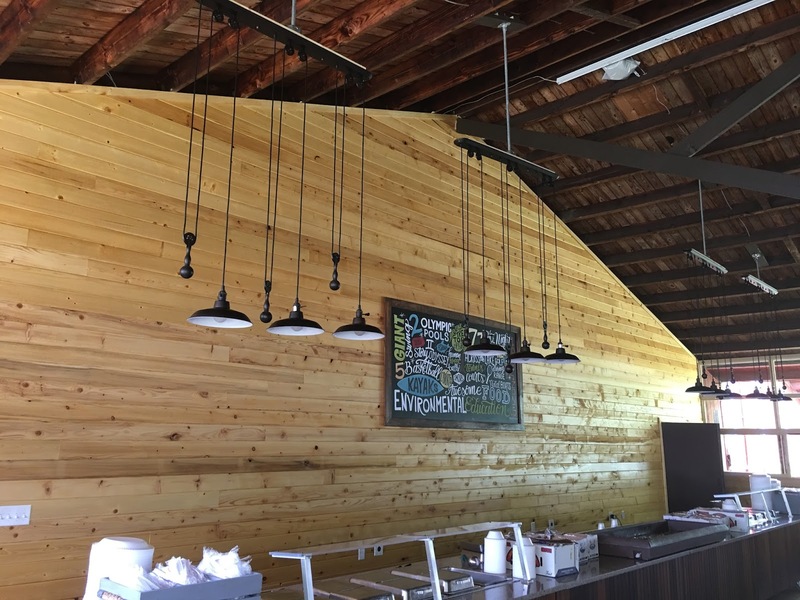 In fact, there is so much knotty pine installed, I was told that over 100,000 linear feet of wood was purchased and installed over the winter months since December! But we’re not done. Make your way into the auditorium and you’ll find a brand new, huge, exhaust ceiling fan in the middle of the seating section. Don’t worry; I already checked it out to see how loud it was and it’s super quiet. We test drove the fan and turned it on low and you could barely hear a hum. As soon as the fan got up to speed, a nice breeze was wafting through the screened windows. 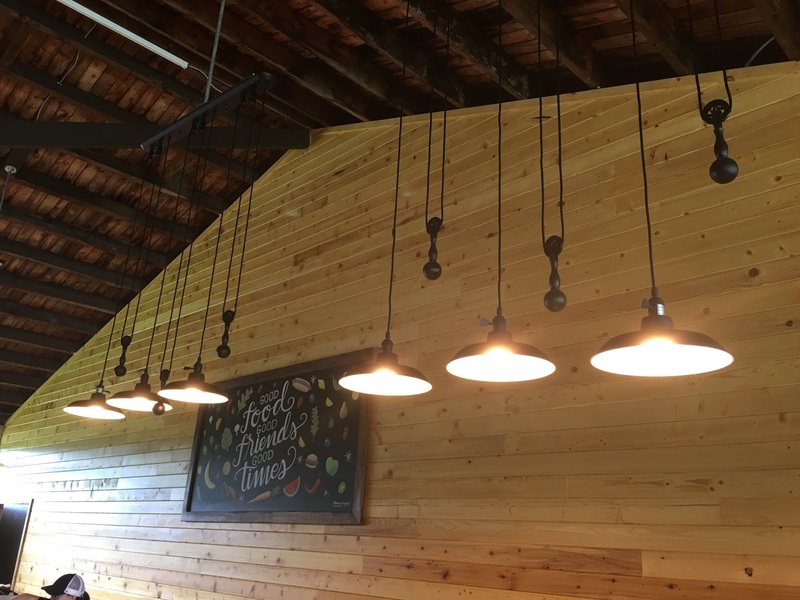 On those hot, swelter-y Pocono evenings when we’re all sitting in the auditorium, we’ll experience the cooling effects of the badly needed major improvement. Oh yeah, I forgot to mention that in addition to the six cabins that have been totally renovated, an additional nine (9) cabins have had significant partial renovations to the back wall (also done in knotty pine) and brand new bathrooms with knotty pine siding, toilets, sinks, showers, faucets, etc. Those cabins are slated for completion by next year with additional cabins being chosen for renovations next year. 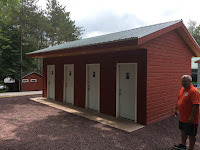 Finally, you’ll see two new buildings near the main camp office – right across the way from the main office by the left dining hall and right outside of the GNI Business Office. One building will be used for storage while the other has multipurpose uses. While the exteriors have been done on both of these two buildings, the interiors still have yet to be completed, but you’ll see noticeable changes when you arrive. Now I’m sure you’re wondering exactly which cabins have been renovated and if any of them are yours. You’ll have to see when you get to camp … if you haven’t signed up to join us for this years’ Gathering, do so! Registration is ongoing through 10:00 am on Wednesday, August 23 but you’ll have to sign up prior to that time for the attendance option of your choice. 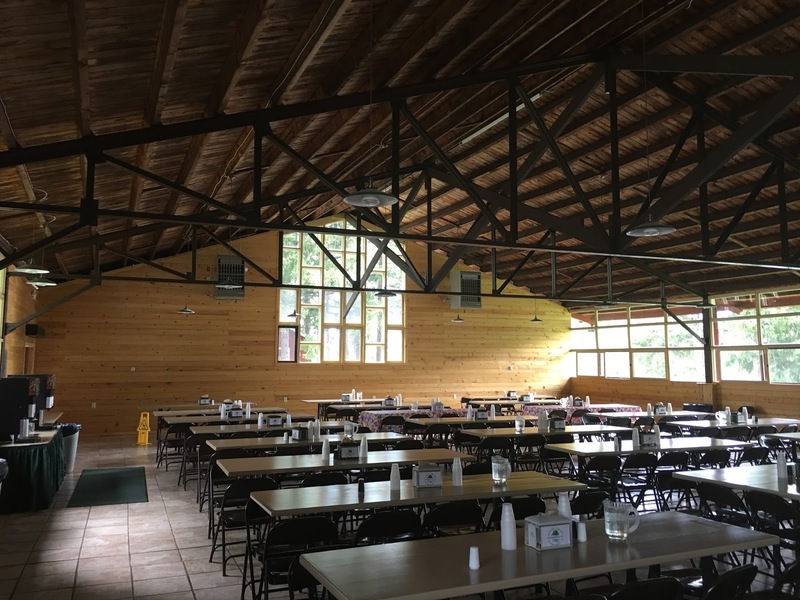 You may be one of the attendees who’s assigned to these renovated cabins! Stormy Weather made her first appearance on the GNI stage in 1999 when she performed in what was then known as the Tuesday Night Talent Show. She returned in 2000 to compete for Miss GNI Lace - and although her first bid for the crown was unsuccessful (she would go on to win the next year), she was clearly starting to connect with the men of GNI. In 2001, that connection earned her a spot as a celebrity panelist on GNI's version of Match Game and, to borrow the familiar phrase, a star was born! Before leaving the Gathering that year, Match Game producer John Positano approached Stormy about headlining a show at the 2002 Gathering. The Tuesday Night Talent Show was renamed and Stormy was back where it all started when The Stormy Weather Variety Show premiered on Tuesday, August 20, 2002. This year marks the 15th Anniversary of the show and after a first-year assist from John, Stormy has served as not only the show's host, but also its producer and director. Of course, the show wouldn't succeed without the combined efforts of stage manager Colin Godwin, sound engineer Preston Birchner, a hardworking crew, and most importantly, the countless men of GNI who have contributed to the show by sharing their talents year after year. The 15th Anniversary Stormy Weather Variety Show will take place at the 2017 Gathering on Tuesday, August 22. Stormy is looking forward to continuing the tradition of introducing new talent to the stage and hoping for the opportunity to welcome back audience favorites from the past. There will be more specifics published in the daily schedule at the Gathering, but if you'd like to be in the show, you will need to attend an audition on Monday morning and, if you are cast in the show, a rehearsal on Tuesday afternoon. Auditions will be held in the order in which you sign up. You will be able to sign up upon arrival at the Gathering, but if you'd like to get a head start, you can sign up in advance by clicking here.